Every WordPerfect document consists of content (the stuff you type) and formatting instructions (the appearance of the document and text). Normally, you work only with the content and the visual results of the formatting operations. However, WordPerfect keeps track of that formatting information behind the scenes through Reveal Codes. If you’re wondering where all these codes are and you want to see them yourself, simply use the View –> Reveal Codes command (or press Alt+F3). Figure 1 shows the WordPerfect window with the Reveal Codes window at the bottom. Figure 1: Strange-looking codes are lurking in your document. The Reveal Codes window shows the same text that you see in the regular window. Because the Reveal Codes window usually cannot hold as much text as the regular window can, it shows the part that’s right around the cursor position. The cursor appears as a red box; its location in the Reveal Codes window corresponds to its position in the regular window. It’s a little hard to scroll up or down in the Reveal Codes window. You can press the navigation keys on your keyboard, such as PgUp and PgDn. Or you can move the cursor in the regular window and allow the Reveal Codes cursor to follow along. Text in the Reveal Codes window is completely unformatted. Spaces appear as little diamonds, and codes look like little buttons. Character and single codes look like little rectangular buttons, and paired codes (such as the two Italc codes) have pointed ends, with the points of each pair pointing at each other. You can type, edit, and perform all your usual WordPerfect activities while the Reveal Codes window is visible; some people like to leave it open all the time. A dividing line separates the regular window from the Reveal Codes window. Using the mouse, you can click the line and drag it up or down. Choose View –> Reveal Codes again. Click the dividing line and drag it down to the Application Bar. Right-click anywhere in the Reveal Codes window and then choose Hide Reveal Codes from the QuickMenu that pops up. Now that you know how to bring the secret WordPerfect formatting codes into the light of day, what can you do with them? In the Reveal Codes window, you can examine the WordPerfect codes, modify them, and even delete them. Some codes contain much more information than you might think. You may see a Header A code at the beginning of your document, for example; this code indicates that you have defined a header. To see more details about this code, use the cursor keys, or click just before the code. The cursor appears as a little red box. Suddenly, the code expands until it says, for example, Header A: Every Page, Chocolate in the Workplace. Many codes contain more information than meets the eye; place the cursor before a code to see just what it says. To change a code, try double-clicking it in the Reveal Codes window. This action tells WordPerfect that you want to do something to the code, and WordPerfect tries to guess what that something is. If you used a dialog box to insert the code in the first place, WordPerfect displays the same dialog box again. If you double-click a Para Spacing code, for example, WordPerfect pops up the Paragraph Format dialog box, which displays the values that you specified when you created the code. (This feature is rather useful.) If you change the information in the dialog box and then click OK, WordPerfect updates the code to match. The position of each code is important, and codes that are in the wrong place can be a headache. If you see a code that seems to have wandered off, you can rein it in. Move your cursor before it and press Delete, or move the cursor just after it and press Backspace. Or simply drag it aboveground — into the top window, where it evaporates in the warm light of day. When the Reveal Codes window is not displayed, WordPerfect skips most codes when you press the Delete or Backspace keys so that you don’t delete codes by accident. 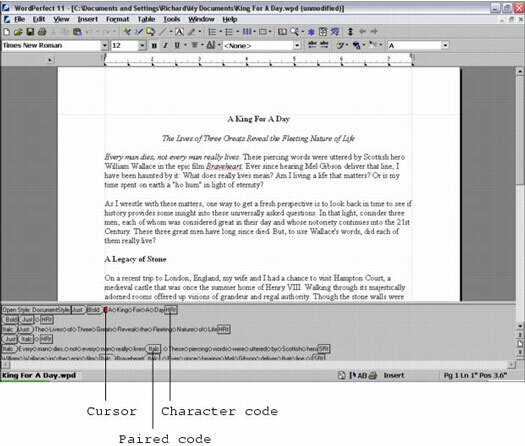 When the codes are revealed, however, WordPerfect figures that you can see what you are doing, and when you press Delete, it deletes the code to the right of the red cursor. Save your document (press Ctrl+S) before you make any changes in codes because it’s easy to make a horrendous mess with this code stuff. If you save your document before you goof up, you can just close the messy version (press Ctrl+F4) and reopen the original (press Ctrl+O) to start fresh. Your trusty friend Undo (Ctrl+Z) works when you make changes to Reveal Codes as well.